210 Fuel Shortage | Tennessee Aircraft Services, Inc.
Troubleshooting is an interesting art that I find immensely rewarding, but only when successful. To me, successful means a logical approach is followed using available data, research when needed, and maybe some tests which all culminate with a confirmed diagnosis. Eventually, all technical problems get resolved, but not all are a result of successful troubleshooting. Then there are those occasions when someone has sabotaged the process well before the problem presented itself. A new customer arrived at the shop with a self proclaimed squawk free P210. Of course, I was suspicious right off the bat. After some conversation with the owner, he soon revealed a lack of fuel flow during climbs, resulting in higher than desired CHT. He blew if off as just a normal 210 issue according to his last mechanic. Before he left we discovered several more issues with the plane that he’d just been living with because he’d been told “that’s just how it is”. Just a few minutes into the annual inspection, and it was clear the previous mechanic was not familiar with the 210 series. Had this realization sunk in, it would have saved me some frustration later. During the inspection we reviewed the aircraft’s engine data and confirmed the max fuel flow was below specifications. This discovery combined with the high CHT complaint caused us to recommend a complete fuel system setup be performed in accordance with Continental Motors maintenance manual M-0. This procedure was formerly contained in SID 97-3. The owner authorized the effort, and not surprisingly, we found every parameter of the system well outside of the specifications. This is a common problem and routine procedure, so we weren’t expecting any surprises. About here is where our frustration began. The procedure began by setting up the engine fuel pressure and idle mixture with the engine running at idle speed. Just a few simple adjustments and the “lower end” was working as published. On the top end with full power applied, adjustments didn’t go so well. After a little investigating, we found the mixture lever on the fuel controller was not reaching its mechanical stop. Simple enough, we just extended the mixture control rod end so the mixture lever would contact its stop before the knob in the cockpit touched the instrument panel. The max power operations adjusted just as they should, and all was well, until we pulled the throttle back to idle. Everything on the low end was now out of kilter with no logical reason why. Pulling the mixture knob all the way back caused the engine to just lope along but wouldn’t quit unless we pushed the throttle forward. No chance at all of getting the small RPM rise when the mixture was pulled to idle cut off. The top end adjustments are last in the sequence and should have minimal to no effect on the previously made low end adjustments. We started the process all over again, but none of the adjustments returned the expected results. Now we had to think in terms of troubleshooting a problem instead of just performing a routine maintenance function. As in flying, we returned to the last nonstandard adjustment made, which was lengthening the control cable. On closer evaluation we discovered the mixture lever wasn’t making contact at the idle cut off position. Basically, the red mixture knob just didn’t pull back far enough. 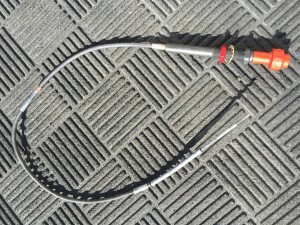 We disconnected the cable from the fuel control lever and measured the maximum travel of the control cable. We then measured the distance the mounting hole in the mixture lever arm traveled and found it exceeded the cable throw by about one eighth inch. So then we knew the problem, but we didn’t know the cause. Two wrongs don’t make a right. This red knob (Mixture) has too much space between the knob and the panel at about one half inch. 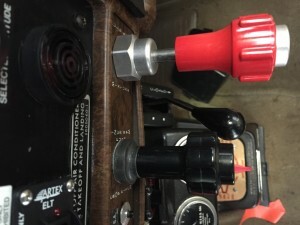 The black knob (throttle) is bottoming on the panel, so one doesn’t know if the lever at the engine is truly full throttle. We had never seen a cable fail by just having shorter than normal travel. The normal failure mode for these cables is that they get very stiff or even lock up. Ambient temperatures change the internal friction after many years of wear, which can change the functionality as the engine compartment heats up. On a really bad day, the cable might break and pull all the way out, leaving the engine’s mixture lever unattended. Fortunately, those really bad days are very rare. Cable replacements are not rare, but they are expensive. The throttle, prop, and mixture control are all very similar in design and cost. Those with the vernier control can tip the scales near the thousand dollar mark from Textron. It doesn’t take much internet searching to find nearly identical units available on any number of aftermarket aviation parts houses for one third the price of the certified units. They look the same (red knob with a button in the middle) and can be purchased to any custom length. It meets the same fit, form, and function, so what could possibly go wrong? Just a simple push pull cable but capable of causing a lot of trouble. I’m an experienced aircraft owner with a near lifetime of looking for ways to manage costs (the most effective being invisible ink in the checkbook). In the process of saving money, I never step beyond the line of safety or legality. For that reason, parts that don’t have some approved paperwork or method of acceptance just don’t make their way to our shop. When we find them on a customer’s plane, it always creates trouble. The path to using unapproved parts is complicated and uncertain. The simple first step of ensuring the replacement provides the exact same fit, form and function cannot be overstated. As it turned out, the mixture cable on this plane wasn’t broken at all. It took some effort with a borescope, but we were able to find a sales tag on the cable housing tucked in under the instrument panel. Sure enough, it was an after-market unit intended only for experimental aircraft. We contacted Textron engineering for specifications on the proper cable and compared that to the specifications for the experimental unit on the plane. Wouldn’t you know, it was exactly one eighth inch different. We notified the owner of our discovery and how it explained a couple of the operational problems he’d been experiencing. His slight disbelief was understandable once he informed us that just a couple of years before had replaced that very control. He did recall his mechanic had reported finding a less expensive alternative to the very expensive Cessna part. As is the case sometimes, convincing the owner can be more difficult than the troubleshooting. It took a few emailed pictures to fully win him over. Of course we saved the removed cable for possible future reference. 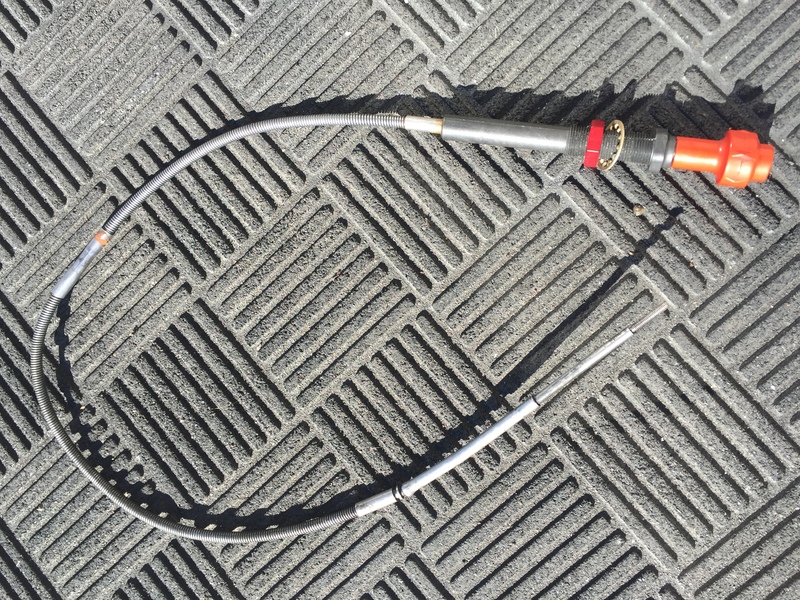 We were able to find an aftermarket FAA PMA mixture cable that cost about one third less than the Textron unit but twice the cost of the non-certified part (that didn’t work). Once installed, the mixture travel adjustment worked just as it should. We now had a mixture control that moved the fuel control lever from stop to stop with authority. The fuel system set up was a breeze this time around. Just one attempt at each setting and all performed just as expected. This view looking down at the back of the engine. 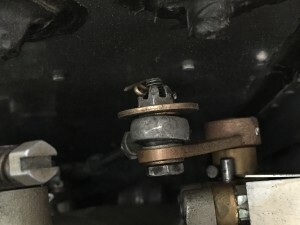 The brass lever is the mixture control arm with the control cable mounted via the bolt with the castellated nut on the right. Near the pivot point of the arm you can see the steel pin protruding out that constitutes one of the lever’s travel stops. This one is fully engaged. Most troubleshooting is an effort to discover what component has failed. Experienced general aviation mechanics can isolate the most common faults just during the initial conversation with the pilot. There are few problems we haven’t seen, so it’s mostly done by rote. That’s all good until faced with a problem that isn’t a result of any normal operation related cause. The possibility of sabotage just isn’t within the standard troubleshooting flowchart. This particular event occurred a couple of years ago. Since then we’ve seen the same problem several more times and most recently just a couple of weeks ago. The ever increasing cost of aircraft ownership is driving owners and maintenance providers to look for more creative ways to manage. My concern is that some are not doing due diligence to ensure their creativeness is returning the plane to a proper state of airworthiness. What a difference an eighth of an inch can make. In this case the difference is very quantifiable. First the cost of installing the uncertified cable is lost. Then throw away our charge for troubleshooting. Extra down time is a factor as well. Aside from the very real safety concerns and legal implications, the cost of using unapproved parts can be an unknown. Like my wife used to tell her middle school students, “you can chose your actions but not the consequences”. The next time you decide to use an unapproved part, be sure it’s truly a match or be prepared for unknown consequences.